each provence. French Country reflects the warm, earthy, unpretentious, and comfortable way of life in this region. reds, and yellows. Decorative hardware or what they called “Ferrures” adorned the furniture. I personally love French Country Style and is my favorite design style. It is the one design style where I always feel most at home. It could be I have been surrounded by it personally and professionally literally my whole life. I think the sophisticated, yet relaxed feel it has is what I enjoy most about it. However, I am not a huge fan of the brighter colors and Rooster motifs you do see in this style. Some notable architectural details you will see in this style are curves and symmetry. You will find many free standing furniture silhouettes such as armories, side table, and dining tables, along with a lot of paneling on walls. Exposed beams were widely used in kitchens and main living areas. In mouldings and trims you will find simple details and carvings that are more free flowing instead of being very formal looking. Colors used throughout this style are Provence blues, yellows, terracottas, reds, earthy browns and greys are the basis of good country french design. Finishes can be worn and distressed whether using paint colors or stain colors. They elicit a comfortable relaxed feel to a room. Metal is definitely mixed in with wood. Metal seems to be included more in lighting and accessories and sometimes used in wood work whether it is inserted in to table tops or as table bases. Rustic flooring from wide-planked wood floors to brick or stone set the rustic, relaxed tone of a room. You will see texture used in fabrics, wood furniture in the finishing, and of course the flooring. Bold or very colorful geometric patterns should not be included in French County Design in flooring or fabrics. Fabrics mostly used are chintz, toile, cottons, and linens and blended for a layered look. Also used are florals, tapestries, and farm animal motifs. Specific furnishings are very important to get a true feel for French Country style like servers or buffets with raised panels. A simple mirror frame, or a rustic farm table with Ladderback chairs can give a room a French Country feel. Painted armoires are commonly used as focal point in country French décor and can now be used to hide TV’s, or just to be decorative. 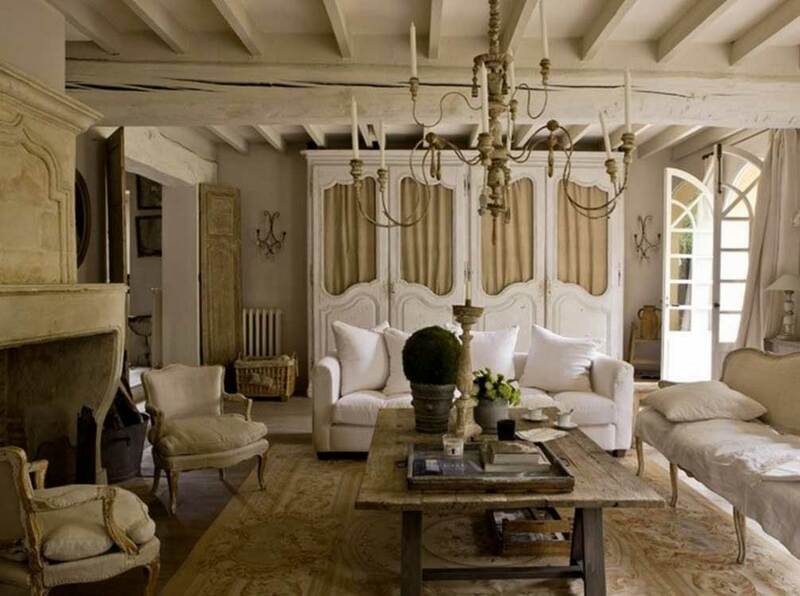 It’s the blend of rustic wood, painted pieces, metal, glass, gilt that makes country french so adored. Homeowners can simply add in a painted cabinet in a dining room or add in a coffee table. 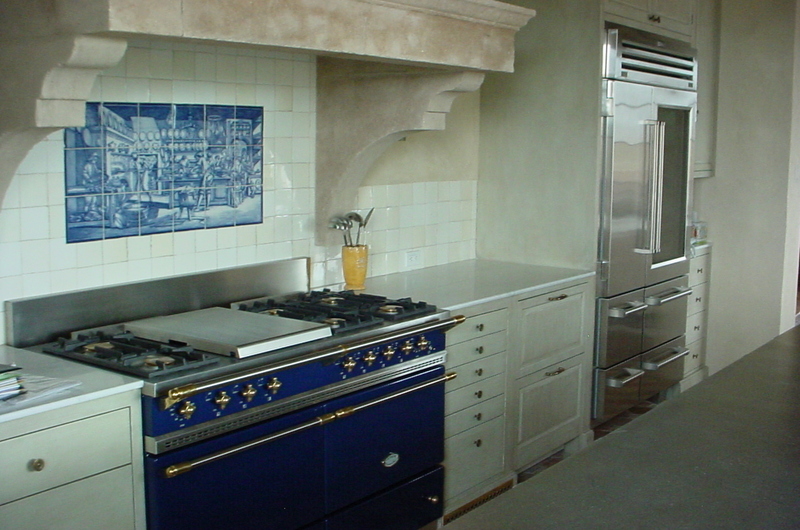 However, with French Country design, the whole look is in the finishing. It needs to feel worn or aged, even if it is sophisticated looking. The right style of lighting for French Country would be wood mixed with metal, or just metal, but dainty, nothing heavy. Lighting placed in almost any room in the house is important, not just the dining room. Small simple chandeliers with not much crystal adornment can be hung in an entry way, powder bathroom, over a kitchen island, or even in the bedroom. Candle sticks in both metal or wood, rattan baskets, iron plant holders are very popular accessories. 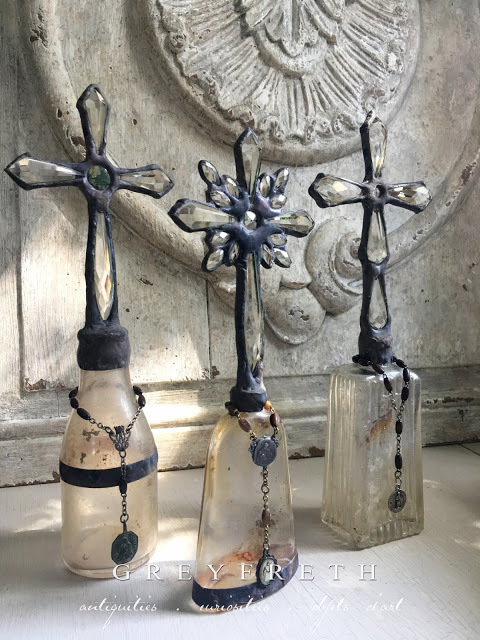 I also came across some exquisite “cross bottles” that are widely used in accessorizing but I was not able to find what the original use was for them. This style does not feature bold colors for the most part in any design elements, only sometimes reds or blues are used, but mainly in fabrics and accessories. Colors in art are generally very muted and soft and are mainly small groupings of art pieces. The mood created from this style is sophisticated yet relaxed to live in. It is quite easy to incorporate elements of this design style into your home. You could refinish and reupholster your dining chairs in a light worn painted finish and keep your warm stain finished dining table. You can do a grouping of accessories on a fireplace mantle or buffet with either some art or a mirror. Please contact Jeannot Custom Cabinets for an estimate to build your French Country style cabinetry.